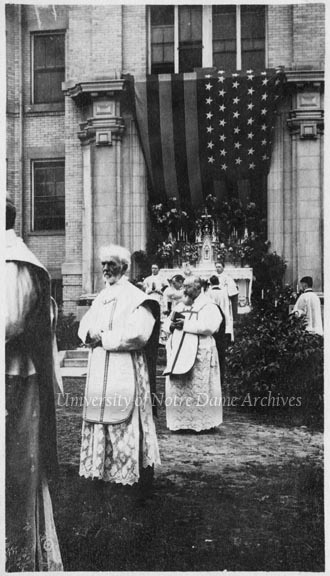 Enrollment at Notre Dame declined during the Great Depression for economic reasons. The need for men in the military during World War II again threatened enrollment levels. In an effort to keep Notre Dame, an all-male institution, a viable, University President Rev. 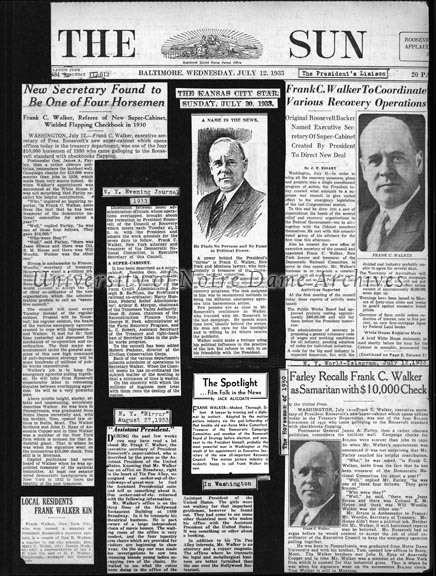 Hugh O’Donnell, CSC, allowed the Navy to establish a V-7 training program on campus in 1942. The V-12 program arrived in 1943. 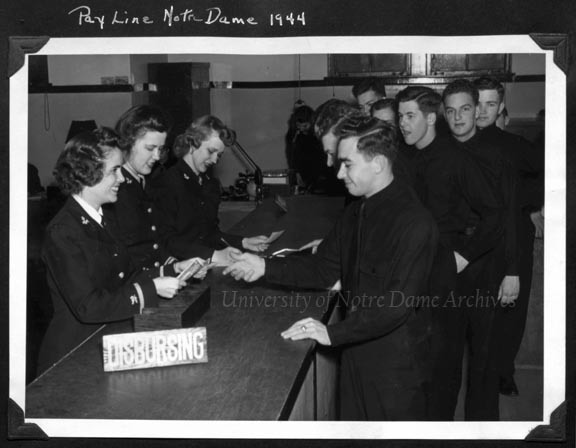 While many are familiar with this part of Notre Dame history, few remember that the WAVES were also stationed on campus in the 1940s. 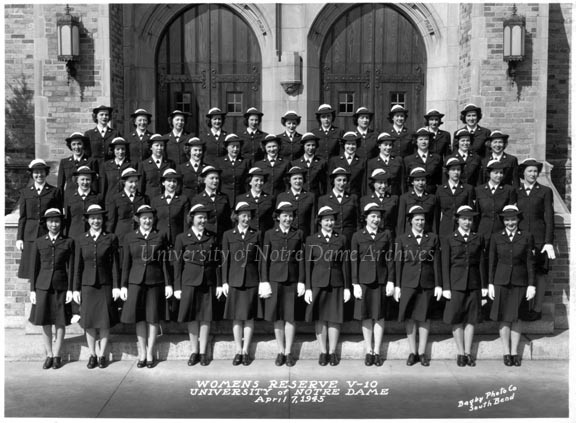 The WAVES arrived on campus in July 1943, but they lived in the Oliver Hotel in downtown South Bend. “They work in the local Navy offices, drive Navy cars and in other ways take over the places of Navy. … The group is made up of both commissioned and non-commissioned personnel” [Scholastic, July 6, 1943, page 8]. Some of the women did learn to fly, to which Scholastic joked, “If and when the time comes for their initial solo, the gals have promised to notify the University, as time must be had to double the insurance on the Dome, you know!” [Scholastic, March 31, 1944, page 8]. 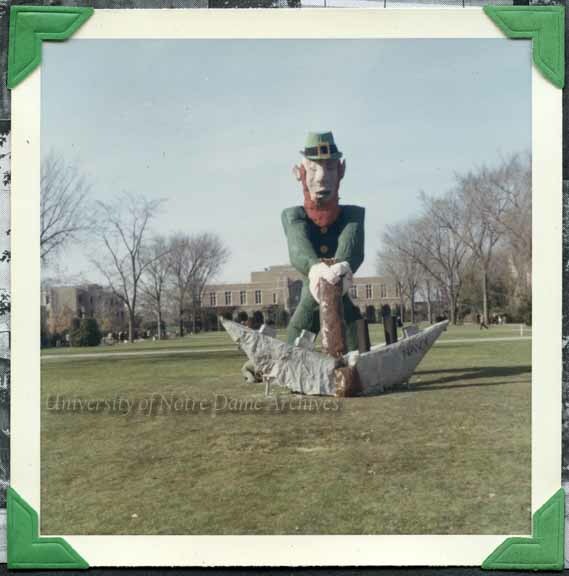 Since the WAVES were not officially affiliated with the University, the Notre Dame Archives does not have many records of their time on campus. However, the University Archives is extremely fortunate to have the scrapbook kept by Ethel E. Larkin Roselle, a WAVE stationed at Notre Dame and later Harvard University. The photos from this blog post come from her scrapbook. Interesting to find out how much those guys were paid in the picture?